TRIMELA: Each gram cream contains Fluocinolone acetonide USP 0.1 mg, Hydroquinone USP 40 mg and Tretinoin USP 0.5 mg.
Fluocinolone acetonide is a synthetic fluorinated corticosteroid that reduces inflammation. Hydroquinone is classified therapeutically as a depigmenting agent and interrupts one or more steps in the tyrosine-tyrosinase pathway of melanin synthesis. Tretinoin is a metabolite of Vitamin A is classified therapeutically as a keratolytic. It works by increasing the skin cell turnover rate, which helps exfoliate the skin. TRIMELA cream is indicated for the short-term treatment of moderate to severe melasma of the face, in the presence of measures for sun avoidance, including the use of sunscreens. TRIMELA cream should be applied once daily at night. It should be applied at least 30 minutes before bedtime. A thin film of the cream should be applied to the hyperpigmented areas of melasma including about ½ inch of normal appearing skin surrounding each lesion. Cream is for short-term (up to 8 weeks) treatment of moderate to severe melasma of the face. It is not for long-term (more than 8 weeks) or maintenance (continuous) treatment of melasma. •Apply TRIMELA Cream at night, at least 30 minutes before bedtime. •Gently wash your face with a mild cleanser. Don’t use a washcloth to apply the cleanser, just your fingers. Rinse and pat your skin dry. •Put a small amount (pea sized or ½ inch or less) of TRIMELA Cream on your fingertip. Apply a thin coat onto the discolored spot(s). Include about ½ inch of normal skin surrounding the affected area. •Rub the medicine lightly and uniformly into your skin. The medicine should become invisible almost at once. If you can still see it, you are using too much. •Do not use more TRIMELA Cream or apply it more often than recommended by your doctor. Too much TRIMELA Cream may irritate your skin and won’t give any faster or better results. •Do not cover the treated area with anything after applying TRIMELA Cream. •You may also use a moisturizer and cosmetics during the day. Use a sunscreen of at least SPF 30 and a wide-brimmed hat or umbrella over the treated areas to protect from sun. Safety and effectiveness of TRIMELA cream in pediatric patients have not been established. The most frequently reported events were erythema, desquamation, burning, itching, irritation, dryness, hypopigmentation, perioral dermatitis, allergic contact dermatitis, secondary infection, and skin atrophy at the site of application. The majority of these events were mild to moderate in severity. 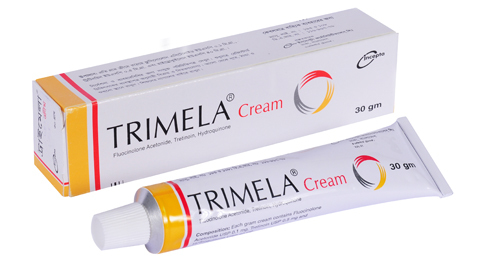 TRIMELA cream contains hydroquinone and tretinoin that may cause mild to moderate irritation such as skin reddening, peeling, mild burning sensation, dryness, and pruritus. Transient skin reddening or mild burning sensation does not preclude treatment. If a reaction suggests hypersensitivity or chemical irritation, the use of the medication should be discontinued. TRIMELA cream also contains the corticosteroid fluocinolone acetonide. Systemic absorption of topical corticosteroids can produce reversible hypothalamic-pituitary-adrenal (HPA) axis suppression with the potential for glucocorticosteroid insufficiency after withdrawal of treatment. Manifestations of Cushing’s syndrome, hyperglycemia, and glucosuria can also be produced by systemic absorption of topical corticosteroid while on treatment. If HPA axis suppression is noted, the use of TRIMELA cream should be discontinued. Pregnancy Category C. TRIMELA cream contains the tretinoin, which may cause embryo-fetal death, altered fetal growth, congenital malformations, and potential neurologic deficits. There are no adequate and well-controlled studies in pregnant women. Trimela cream should be used during pregnancy only if the potential benefit justifies the potential risk to the fetus. It is not known whether topical application of TRIMELA cream could result in sufficient systemic absorption to produce detectable quantities of fluocinolone acetonide, hydroquinone, or tretinoin in human milk. Because many drugs are secreted in human milk, caution should be exercised when Trimela cream is administered to a nursing woman.